On November 29, at approximately 9:26 PM, Davis Police officers responded to investigate a missing person identified, by family members, as Rosemary Pearl. Rosemary Pearl was last seen on 11/29/13 at 8:30 AM in the 1100 block of Chestnut Lane. Pearl may be afflicted with a medical condition that impacts her memory and causes disorientation. Rosemary Pearl is believed to be headed to the Chico area. The initial investigation revealed no signs foul play. Rosemary Pearl is a Caucasian female, 65 years old, approximately 5’5” in height, and weighs 160 lbs. Pearl has gray hair and brown eyes. She was last seen wearing a green sweater and dark color pants. 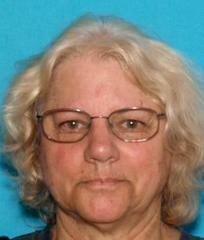 Rosemary Pearl may be driving a red 2003 Ford Escape with California License plates: 4ZXS807. The Davis Police Department is asking for the public’s assistance. If you see Rosemary Pearl, her vehicle, or have any information about her whereabouts, contact the Davis Police Department immediately at 530-747-5400.